Bostel Amsterdamse Bos i Amsterdam, Nederland: Bestill nå! We'll charge the remaining amount 2 weeks before arrival, there is no refund if you cancel the reservation within those 2 weeks. 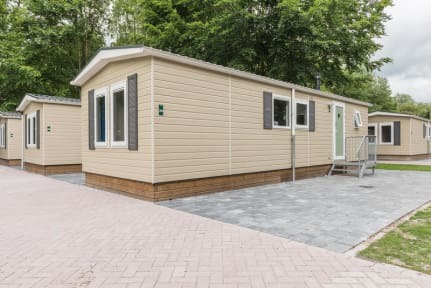 Our campground & hostel is ideally located on the verge of Amsterdam, only about 30 minutes from the fantastic city center. It’s a beautiful location for a city campground, in the middle of the vivid heart of Holland. Yet this is a quiet, peaceful forest where you can relax or enjoy nature by having a nice walk around or doing some swimming, biking or canoeing. Our hiker’s cabins are basic, small wooden houses, suitable for two, four or five persons. They are equipped with either two singles (the two-person cabins) or two bunk beds (the four-person cabins). The five-person cabins have two bunk beds and one single bed. Besides that, the cabins are fitted out with a table and chairs and one electric socket (two ampere). Heating is optional. Our camping chalets are well isolated chalets with four bunk beds, so they’re suitable for a maximum of eight persons. There’s also cupboards, a table and chairs. There is one electric socket (two ampere) and heating is also possible (optional). Our very new Chalets Florida (from November 2011) are the stars of our campsite. 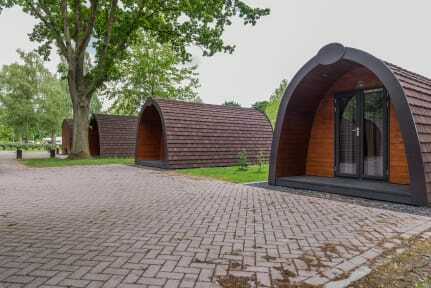 These are chalets, suitable for four-to-six people, and come complete with kitchen, bathroom and three bedrooms (two with two bunk beds and one with two single beds). These non-smoking chalets have central heating. Your home away from home! At the campsite you will find free parking, bed linen and towels for rent plus free maps and guides. Also in our beautiful green grounds you will find a big kitchen; please note there is no fridge. You can buy your ingredients at our minimarket! All of our sanitary buildings are new and heated and we also have washing/drying machines available. The hot showers work with tokens that you can buy at reception. Our accommodation are supplied with free pillows and blankets; bed linen/towels can be rented or bring your own. Our campsite is easily reached by public transport with the metro (15 minutes’ walk away) and the bus. There’s also a night bus every night!! Please note that pets are not allowed in the accommodation. Please read our Things to Note below before booking.